Wake Forest is a town located in north Wake County, north of Raleigh, North Carolina. Wake Forest is located on the “fall line,” the separation between the North American Piedmont and American Coastal Plains regions. Shown in the photo is the charming downtown area. Wake Forest received its roots primarily from development of Wake Forest College, now Wake Forest University, relocated to Winston-Salem. In 1820, a New England transplant named Calvin Jones bought 615 acres of forested land in Wake County, North Carolina. The area was not very populated, and soon came to be known as the Forest of Wake, later Wake Forest. Jones later sold his farm and land to the North Carolina Baptist Convention for $2,000, who opened the Wake Forest Manual Labor Institute, later Wake Forest College, on the site. The Raleigh & Gaston Railroad, completed in 1840, established a station in nearby Forestville that stimulated the school and surrounding village. College leaders convinced the railroad to move the depot even closer to the college in 1874, leading to more economic development. 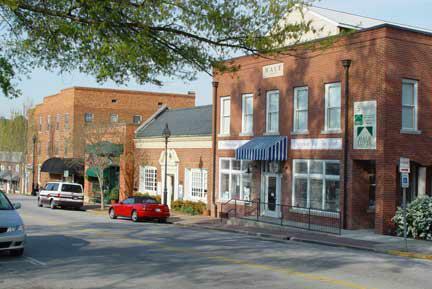 This community was named “Town of Wake Forest College” and officially incorporated in 1880. The term “college” was removed later in 1909. 6.3% of the population and 8.8% of families live below the poverty line.